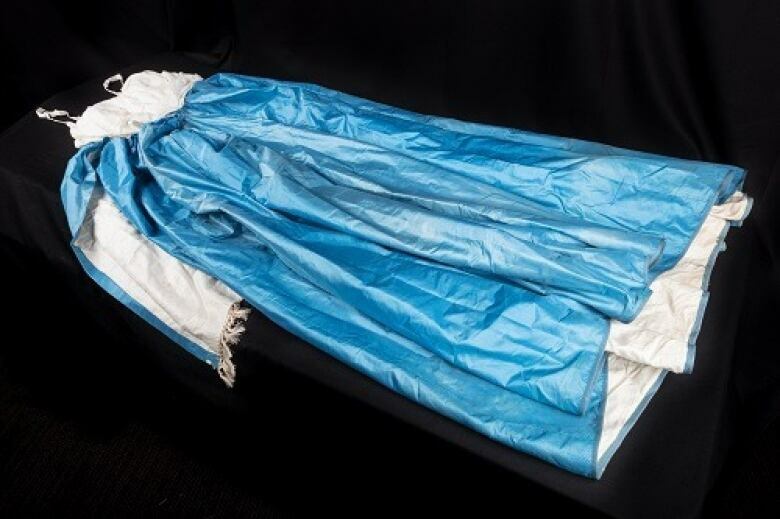 The curator of Western Canadian History at the Royal Alberta Museum is adding a new piece to the museum's collection - a bright blue silk dress which dates back to 1870. Julia Petrov was not surprised to learn that the bride wore electric blue. 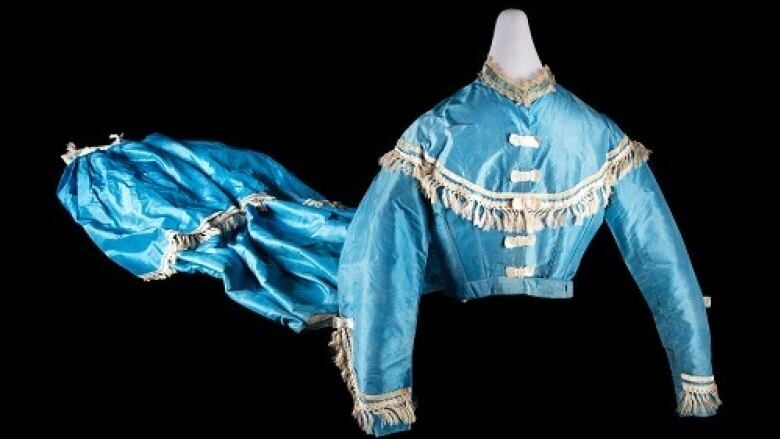 The curator of Western Canadian History at the Royal Alberta Museum is adding a new piece to the museum's collection — a dress of bright blue silk which dates back to 1870. "We see black and white photographs so it's hard to imagine, but people wore very, very bright colours," Petrov said in an interview with CBC Radio's Edmonton AM. "I suspect it was a wedding dress. It's about right for the time period. I'm sure many generations of the family knew that, and then that knowledge was lost." The gown has been a treasured heirloom for seven generations of women, but the family didn't always keep it tucked away in a box. The gown first caught the curator's eye when she came across an Edmonton newspaper clipping from 1967. Elaine McKernan Niemetz had donned her great-grandmother's then century-old dress for one of the costume parties taking place to celebrate Canada's centennial, and her ensemble was featured in the paper. A few weeks after admiring the old photograph, Petrov got a call from the family in Tofield. They wanted the dress to have a place in the museum. Petrov was more than happy to oblige — she said it felt like fate. "I was really excited," Petrov said. "When they emailed me, I knew exactly what they were talking about. So I was thrilled that they were offering it to us." Petrov was invited to the family home in Tofield where she met Elaine McKernan Niemetz and her daughter, who shared what they knew about the gown's origins. The dress has all the trappings of the time. With a white velvet ribbon, a silk fringe and a large fishtail bustle, it would have been worn over a chemise, corset and cage hoop skirt. Alterations and signs of wear show that the dress was valued and worn by several generations of the family, Petrov said, and the rich colour of the silk is characteristic of the synthetic dyes that were so popular in the 19th century. "It would have been really stunning because, if you can imagine, people were burning coal fires and wood fires, there would have been a lot of smog in the air," Petrov said. "And if you think about a bright colour like that, it would have really stood out." The family did not know the name of the original owner, but with a little research, Petrov discovered it belonged to Margaret Hanlon. She married Jeremiah Sweeney in January 1870 in Wellington, Ont. The bride wouldn't have been able to afford a white wedding gown, Petrov said. "She was the daughter of Irish immigrants and she was marrying quite a poor tenant farmer, Irish immigrant, so she wouldn't have the money to buy a white dress," Petrov said. "But she would have bought something that she could have worn on Sundays to church, as her best dress." "It would have been a teeny little bit old fashioned, but again in rural Ontario, it might have taken a little while for French fashions to catch up there." When Margaret's daughter moved to Alberta in the early 20th century, her mother's dress came with her. It's been cherished by the family long after its story of origin was forgotten. The gown will become the oldest dress in the museum's collection. It will be lovingly restored before it's eventually put on display to the public. Letting the gown go was emotional for the family, said Petrov. "They had some great memories … but it's almost 150 years old at this point so they were aware that they couldn't take care of it for too much longer. "They felt that the museum was a better place, and then they could share it with the rest of Alberta."